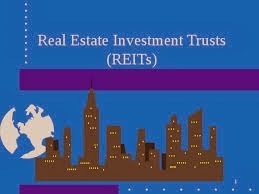 Real Estate Investment Trusts (REITs) have been globally-accepted practices to real estate funding. A real estate investment trust (“REIT”), is a company that owns – and typically operates – income-producing real estate or real estate-related assets. What distinguishes REITs from other real estate companies is that a REIT must acquire and develop its real estate properties primarily to operate them as part of its own investment portfolio, as opposed to reselling those properties after they have been developed. The income-producing real estate assets owned by a REIT may include office buildings, shopping malls, apartments, hotels, resorts, self-storage facilities, warehouses, and mortgages or loans. Why should you invest in REITs? REITs provide a way for individual investors to earn a share of the income produced through commercial real estate ownership – without actually having to go out and buy commercial real estate. Many REITs (whether equity or mortgage) are registered with the SEC and are publicly traded on a stock exchange. These are known as publicly traded REITs. In addition, there are REITs that are registered with the SEC, but are not publicly traded. These are known as non-traded REITs (also known as non-exchange traded REITs). You should understand the risks of the different types of REITs and their strategies before deciding to invest in them. To qualify as a REIT, a company must have the bulk of its assets and income connected to real estate investment and must distribute at least 90 percent of its taxable income to shareholders annually in the form of dividends. REITs offer a way to include real estate in one’s investment portfolio. Additionally, some REITs may offer higher dividend yields than some other investments. Non-traded REITs are illiquid investments. They generally cannot be sold readily on the open market. If you need to sell an asset to raise money quickly, you may not be able to do so with shares of a non-traded REIT. Unlike publicly traded REITs, however, non-traded REITs frequently pay distributions in excess of their funds from operations. To do so, they may use offering proceeds and borrowings. This practice,, reduces the value of the shares and the cash available to the company to purchase additional assets. How to buy and sell REITs? You can invest in a publicly traded REIT, which is listed on a major stock exchange, by purchasing shares through a broker. You can purchase shares of a non-traded REIT through a broker that participates in the non-traded REIT’s offering. You can also purchase shares in a REIT mutual fund or REIT exchange-traded fund. At a time when the real estate sector is reeling under liquidity crunch and poor sales, the Securities and Exchange Board of India (Sebi) has re-initiated the process of introducing real estate investment trusts (Reits) in the country. According to the proposed regulations, Reits will be registered as trusts with Sebi. These trusts will not be allowed to launch any scheme. Reits, which will raise funds through initial offers, will have to list their units on exchanges for trade. They will be allowed to raise additional funds through follow-on offers as well. As with any investment, you should take into account your own financial situation, consult your financial adviser, and perform thorough research before making any investment decisions concerning REITs.